It’s been a week for Germany in the book stakes. Also on Twitter, but let’s stick to the books for now and start with Christopher and Columbus by Elizabeth Von Arnim. This is my fourth or fifth book by Von Arnim and as usual it is written with great humour and charm. However, and despite all that, this is also rather a forlorn book. The Christopher and Columbus of the title are two half-German girls in their late teens in the year 1915. Recently orphaned and now being sent to America by an English uncle who finds them an embarrassment, they are aware that having left they will be enemy aliens and Britain won’t have them back. This is a recurring theme through the book, that the two girls can only be English or American by no longer being German - and while I’m sure it was probably the case, the fact that it’s simply accepted, by them and by the narrator, and despite having lived their whole lives in Germany - made me rather uncomfortable. The inevitable happy ending is, therefore, uncomfortable too, and the description of the two girls as ‘German outside and English inside’ made me positively squirm. She gets away with it though. Her humour picks the book up and the characters are great fun and intelligently written – the way the Twinklers talk for each other and sometimes as one and sometimes independently, as close siblings will do, is very well done. Their self appointed guardian angel Mr Twist is also beautifully drawn – too nice to be real, but real enough to be human. But still, as I say, I found it a forlorn sort of book. The other was The Face on the Cutting Room Floor, ostensibly by Cameron McCabe. It’s a slippery little 1937 mongoose of a detective story that circles and comes back and circles again. Complete, as I wrote on the Guardian book blog shortly after starting it ‘with stream of consciousness writing, overly indented paragraphs and constant irritating wisecracks. I can't work out if it's cleverly done, or the author just couldn't make up their mind what it's meant to be’. Well it’s cleverly done. Very clever in fact. Clever enough that when I got to the postscript written in 1981 I couldn’t make up my mind at first if that was genuine either. It seemed entirely probable that German sexologist Ernest Borneman was also an invention, and the history in his story a 1937 prediction based on intelligent opinion. Even after it became obvious it couldn’t possibly have been written in ’37 (an intelligent observer at the time might be able to predict the upcoming war, but no-one could have anticipated Orson Welles’ bankruptcy) I loosely entertained that idea that it might be written in ‘81 but still fictional – added into the later editions to further bemuse and befuddle. It doesn’t help that Bornemann had the most extraordinary life - multiple careers, countries, experiences; expelled by Germany, interned by the UK, writing this dense and curiously fascinating book while he was still learning English, and handing it in person to Victor Gollancz. Wikipedia added to my suspicions rather than allaying them, capping the story by telling me how Bornemann took his own life at the age of 80 after a tragic love affair with a colleague. And even the obituary in the Independent – which finally put the thing beyond doubt – added yet another curious detail. But perhaps it’s simply that after reading a book like The Face on the Cutting-Room Floor everything in print looks as if it’s not quite real. 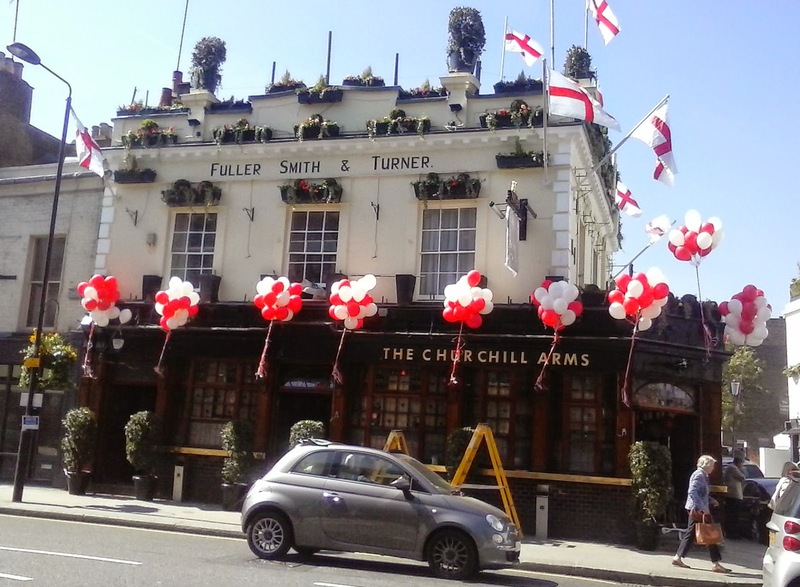 Meanwhile, here in 2015, here is a picture of a London pub being decked out for St George's day, with, I think, a Skoda going past. Balloons and balloons, my deary ducks.